He isn’t a medical doctor. He isn’t an international development specialist. And he clearly isn’t a mother (although he does have four children). More specifically, Wanyama is an assistant professor in McMaster’s W Booth School of Engineering Practice and Technology. 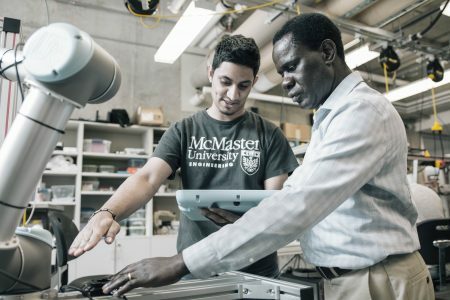 His work focuses on using artificial intelligence in manufacturing – and he’s convinced that the technologies used to monitor and optimize those industrial processes can also be used to improve the health of mothers and babies in Uganda and other developing nations. Wanyama is also now a recipient of a Queen Elizabeth II Diamond Jubilee Scholarship for Advanced Scholars, working as part of a partnership between McMaster and Uganda Christian University in Mukono, Uganda. Researchers from both institutions, as well as NGOs H20 4 All and Save the Mothers, will be working together on initiatives aiming to improve maternal health by addressing issues around drinking water, sanitation and hygiene. Wanyama, who grew up in Uganda’s Busia District, knows this is an uphill struggle. Although lower than those in many countries in Africa, including neighbours Kenya and Tanzania, Uganda’s mortality rates for mothers and babies are still some of the highest in the world. And he’s seen first-hand that external help is often a stop-gap solution. That means that initiatives are launched, but don’t necessarily continue long-term. And because of a lack of continuity, Wanyama points out, organizations may duplicate efforts, or repeat initiatives that aren’t effective. The problem? Lack of data that tells organizations whether what they’re doing actually achieves their objectives, and the artificial intelligence necessary to analyze what data does get collected. Let’s say there’s a health centre in a rural village. Because sanitation is important, an NGO provides it with detergent and soap. There’s also a water pump on the property that provides clean water. But even with these interventions, mothers may not use the centre, or outcomes may be poor. Why? That’s where Wanyama – and his experience working in AI and process improvement – comes in. This kind of monitoring could also be used to improve access to doctors in rural areas. Wanyama explains that many rural health centres don’t have a permanent doctor on staff – instead, a doctor from a city will visit periodically. If the rural centre’s water pump isn’t working that day, or the electricity is down, or supplies have run out, the doctors’ visit is wasted – unless a data collection system could alert them in advance not to make the journey, or let them know that there was a working water pump in the next village. Wanyama plans to start with water monitoring, but he says this type of approach to data could be used on a much wider scale – working with the wide network of cellphones across many countries in Africa to develop apps for expectant mothers, for example. With permission, these could then collect information about the women using them. And in places where medical record-keeping may be inconsistent, using a cellphone app could help fill in the gaps. Eventually, the data collected – a mother’s medical history, genetic information, community, family situation and other information – could be used to create personalized health-care solutions, like flagging a mother for increased follow-up visits. Health centres may also be able to use data to predict when demand on their services will be higher. There’s lots of potential, Wanyama points out. But for now, he’s starting small, working with his colleagues at McMaster and Uganda Christian University and focusing on water. The outcome of his QES-AS scholarship will be a project proposal – which means a lot of work to assess whether what he has in mind is actually possible.